Eltima Flash Optimizer is the most powerful SWF compression solution available with the widest choice of specific optimization settings for in-depth SWF compression manipulation. It dramatically reduces Flash animation size - ideal for Web delivery. 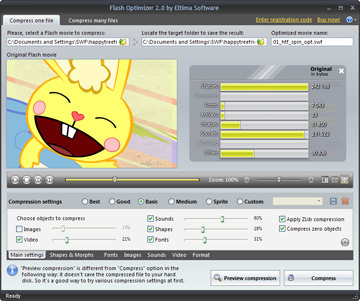 Flash Optimizer includes advanced abilities to compress sounds (converting stereo to mono, lowering bitrate, changing sample rate for output sounds) and video (change video bitrate and frame size), that reduces output file size without significant quality loss.It shows all detailed information on the structure of the movie, size of shapes, images, morphs, sounds, fonts and other elements that it contains before and after compression with Flash Optimizer. This statistic gives you important information and helps you to choose the best compression parameters for a specific Flash file. Flash Optimizer fully supports Flash 5, 6, 7, 8 and Flash 9 as well as ActionScript 2 and 3.Since version 2.1 it also supports Flash 10 and has new command line options.